photo-eye Gallery Interview & Portfolio: Vanessa Marsh photo-eye Gallery is pleased to announce Everything All at Once, a portfolio by Vanessa Marsh, new to the Photographer's Showcase. Everything All at Once is a series of black-and-white cameraless images examining the sublime while comparing natural and manmade power. photo-eye Gallery is pleased to announce Everywhere All at Once, a portfolio by Vanessa Marsh, new to the Photographer's Showcase. Everywhere All at Once is a series of black-and-white cameraless images examining the sublime while comparing natural and manmade power. 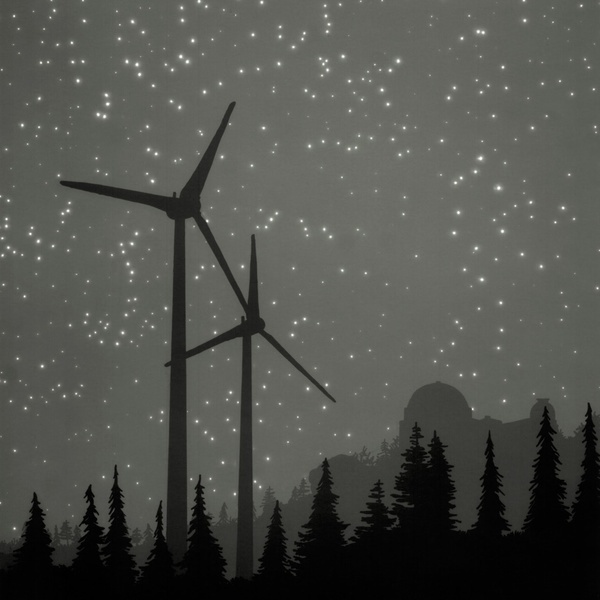 Paradoxically both peaceful and eerie, Everywhere All at Once depicts an enigmatic abandoned landscape whipped by wind, and bathed in starlight. For the blog, photo-eye asked Marsh to elaborate on her choice of imagery, her inspirations, and the process used to create her photographs. photo-eye: Can you tell us how EverywhereAll at Once Got started? How did you begin to create these pictures? Vanessa Marsh: When I started working on Everywhere All at Once, it was originally to challenge a few specific constraints of some of my previous work. First, to rethink the horizon line and the perspective of the viewer, second to experiment with a square composition (which I hadn't worked in before) and thirdly to try to create an image without obviously narrative components in the hopes of creating a more universal space where the viewer could easily find themselves. The initial experiments lead to a new way of working and a body of work that keeps growing. I am finding new challenges within the work everyday. pe: Your imagery seems to deal with energy (both man-made and natural) amusement, and vastness. 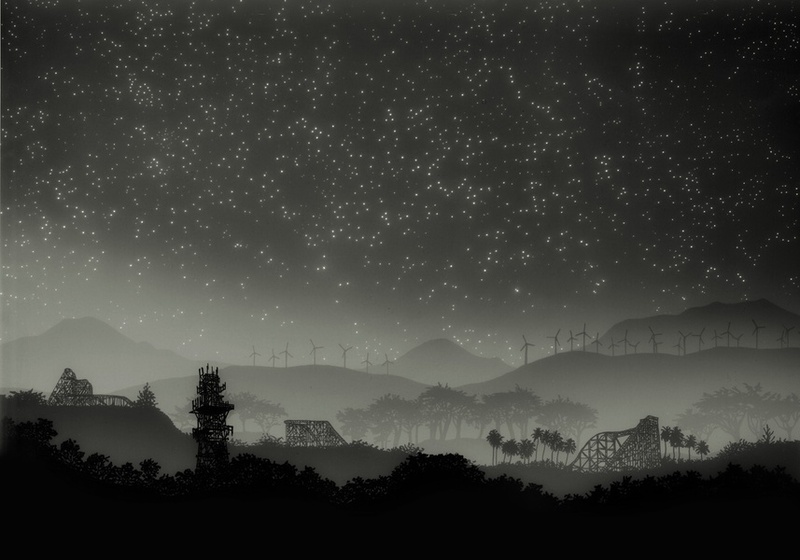 Is there a symbolic meaning in the power lines, roller coasters, and expansive starry skies? VM: The stars help to imagine the planet earth in the context of the cosmos giving perspective on the fragile nature of the system we live in. The stars also represent a sense of unimaginable time and space that is often first experienced in childhood, for myself when starlight was first explained. While the infrastructure of the man made power exists in the images, there is no specific light source other than the stars and a sort of hazy glow, as if there is no power. The landscapes in general represent a near distant future where the infrastructure still exists but is in early decay. They also point to the past, where the actions leading us to our current situation first took effect. 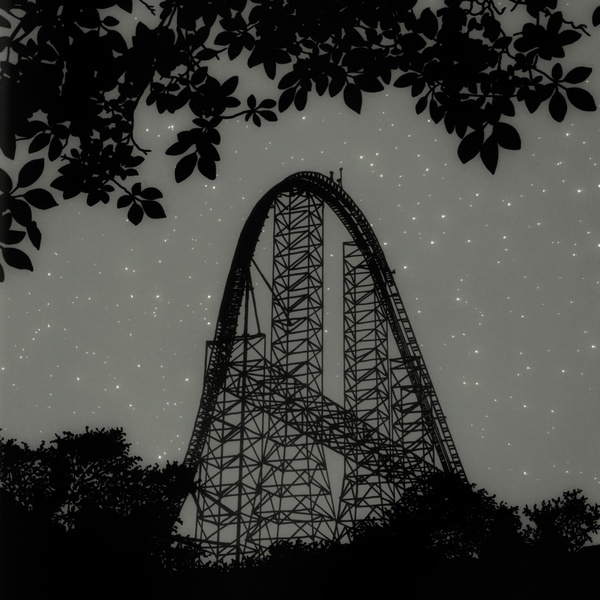 Amusement park rides represent a strange blending of contemporary life and ancient/natural urges. The rides create spaces for humans to feel fear and adrenaline; to get the effects of a near death experience without having to put yourself in any immediate danger. Almost as if we still need those feelings of fear and adrenaline to feel human despite the antiseptic nature of our everyday lives. pe: How are your images made? Can you elaborate about your process? VM: I make the images by first creating drawings on clear mylar. These drawings are then laid on top of light sensitive paper in the darkroom and then the paper is exposed to light. For images with layered landscapes, multiple drawings are placed on the paper which is then exposed at intervals and a drawing removed at the end of each interval. 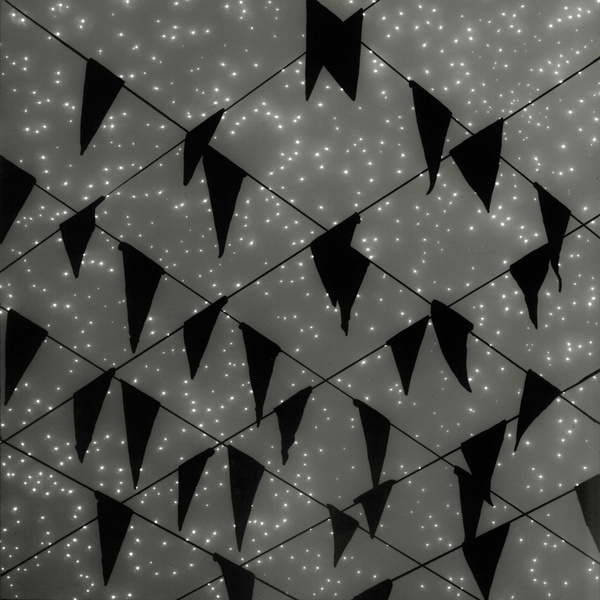 The stars are created by exposing the paper to light through a mask with small holes poked into it. The darkroom aspect of the process creates a photogram negative, which I then scan and invert into a positive image digitally. 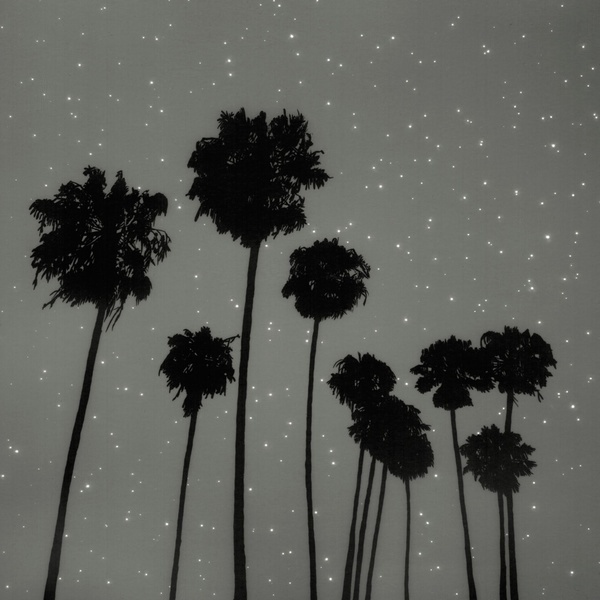 The final images are pigment prints on archival rag paper. pe: Where did the idea to use mylar to build your negatives come from? Why are you interested in making camera less prints on traditional photographic materials? VM: About 6 years ago, I was working on a set of silk-screens at Kala Art Institute and had drawn a roller coaster in sharpie onto some clear plexiglass to use to expose a silkscreen. At the time, I was teaching an alternative photography class and I had brought that piece of plexi along with some train scale models and twigs and moss to give a demonstration on photogram techniques. In researching for the class, I had seen some examples of photograms of rudimentary landscapes created by layering torn paper on light sensitive paper and exposing the paper to light at intervals to create a sense of distance. With that in mind, I layered my own elements onto the paper and created the first images of the series Constellation. From those experiments, the process evolved and was refined (which it continues to do) and I soon began drawing on mylar with opaque paint pens. That was an easy evolution from the plexi, which was too thick and created too much distortion and the sharpie, which let too much light through. Working with drawing in photography allows me to work in a totally fictional environment. My imagination makes the relationships and mood, and I think that is important in creating a space where the viewer can relate his or her own memories and dreams; to create a space that has elements of realness but where that reality is blurred. I want the viewer to question the image and how it was made and what it represents and I think using the photographic medium can open up more interpretations than other arts forms. Photography for me is at the intersections of art and cultural emotional experience and science and the physics of light. It can help us to better understand our world both through artistic and scientific means. pe: Are there any artists you look at or read who helped inspire this series? Is there a specific artist or artwork that helped shaped your practice? VM: For the past few years I’d say the top artists and schools of art I have been looking at include Ansel Adams, Minor White, Robert Adams (the new topographics movement in general), Uta Barth, William Kentridge, Kara Walker, James Casebere, Mariah Robertson, and Hudson River School Painting. I’ve noticed that as I mature as an artist I am more open to where I find inspiration. I may not have looked so deeply at Ansel Adams when I was younger, fearing cliche, but now I find his work and his unique vision and personality very influential. Authors Don DeLillo, Cormac McCarthy, John Steinbeck, Barbara Kingsolver and Rebecca Solnit have shaped the way I understand and look at the landscape. Also, artists that I have studied under, Mark Newport who now teaches at Cranbrook and Jeanne Finley, teaching at California College of the Arts, both helped to shape how I understand my practice in important practical ways and taught me early on about persistence and a thick skin in the art world. Also, my mother is an artist, a painter and graphic designer, so growing up my creativity was always encouraged. My mom gave me my first manual camera which I often still use today.